A few colleges offer Master of Surgery [MS] (Shalya Tantra) course in India. Every college has their Eligibility criteria, Admission process, Exam patterns, Syllabus, Course Structure, Training methods, etc. The average fee for this course ranges between INR 20,000 to 3 Lacs based on the marks obtained in bachelor’s degree examination or an entrance exam scores. Admission for M.S. Shalya Tantra course is based on merit-list or Entrance-exam. Most of the colleges conduct counseling and select students through merit-list prepared by the state-wise universities. Some colleges conduct entrance exam to select students for this course admission. Shalya Tantra which is also called as Samanya is one of the significant branches of Ayurveda. This course provides in-depth knowledge of the principles and features of the modern surgery. After completing this course, graduates may work in areas like Health Centers, Herbal Product Manufactures, Hospitals, Educational Institutes, Medical Tourism, Pancha Karma Centers, Hotels, Private Practice, etc. These professionals may work in positions like Teacher, Shalya Chikitaka, Researcher, Production Manager, Nutrition Expert, Medical Officer, Manager, Kaya Chikitaka, Consultants, Ayurvedic Supervisors, etc. 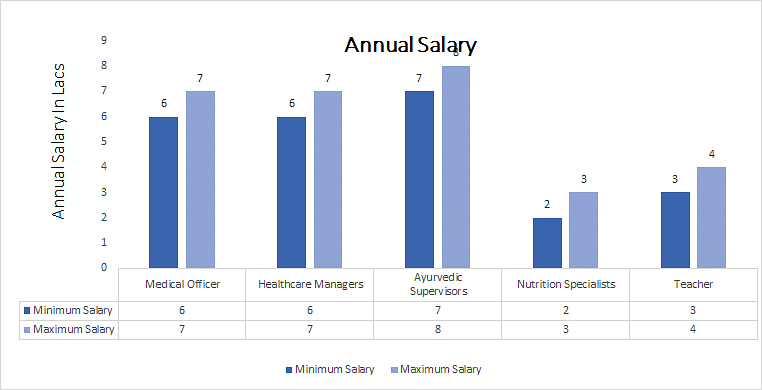 The average salary for these professionals ranges between INR 2 to 20 Lacs as per their experience and expertise in this field. M.S. Shalya Tantra: What is it about? M.S. Shalya Tantra course has made substantial contributions in the areas of Wound Management, Fracture Healing, Ano-Rectal Diseases, and Urinary Disorders. In this course, students will learn study of ancient surgical procedures which explains in clinical, treatises, and surgical applications of various treatment modalities, treatment of chronic diseases, practical training with blood-letting through leeches, successful treatment for piles and fistula, and surgical procedures on patients. This study deals with the surgical techniques, diagnosis of the surgical disorders, and surgical emergency management. This study demonstrates and explains surgical procedures and its knowledge that was performed and used before. This course also describes the surgical treatments in Shalya Tantra which can be used and researched in diseases with side effects and minimum complications. In this course, student’s goals include evaluating and discovering drug compounds, studying dosage requirements, identifying possible interactions with other medicines and discovering the possible side effects of the medicines. Candidates who have completed Bachelor of Ayurvedic Medicine and Surgery degree from a recognized university are eligible for Master of Surgery (Shalya Tantra) course. Candidates who have completed 4 years BAMS course with 6 months of internship are also eligible for this course. Candidates who have passed their bachelor’s degree with 60% of marks are eligible for this course. The percentage may vary from one college to another. Eligible candidates may apply for this course can get applications from the official website of the respective colleges or directly collect from the admission office of the respective college. Note: The Minimum age limit of the candidates applying for this course is not more than 35 years. Entrance exam pattern may vary from one college to another. Some of the other colleges conduct the personal interview along with the entrance exam. Based on both the performances, candidates will be selected for the course admission. Few colleges directly admit candidates for this course. A year-wise syllabus for Master of Surgery [MS] (Shalya Tantra)is given below. The syllabus may vary from one college to other. M.S. Shalya Tantra: Who should opt for this course? Candidates who have a basic understanding of Ayurvedic principles and theories are suitable for this course. Candidates familiar with environmental awareness such as understanding people at work, home, etc. and knowing how someone’s environment influenced by their behavior are suitable. Candidates with interpersonal awareness such as learning about the potential sources of interpersonal conflict and the mechanisms of social communication are suitable. Candidates with problem-solving skills such as the capacity to tackle different types of problems are also suitable for this course. Graduates who have knowledge and skills in Ayurveda will be in demand as new innovations are being developed in delivery systems of drugs, medical production, and drug therapy. These ayurvedic professionals must aid in developing, evaluating, and manufacturing such as capsules, ointments, and medicinal, nutritional, and commercial use. There are huge numbers of opportunities available for the students in both public and the private sector. Graduates can also work in a government sector. After completing this postgraduate degree, they can work at private hospitals, government hospitals, and private medical shops. More career options are available in this field are drug action, drug analysis, drug discovery and design, pharm economics, drug delivery, regulatory options, marketing, and sales are the primary categories. These ayurvedic professionals work for research facilities, government agencies, pharmaceutical companies, laboratories, biotechnological firms, and pharmacies.